I really wanted a Chinese Chicken Salad today. Like the kind you find in diners that haven’t changed their menus in 30 years. The kind with crunchy cabbage, those crispy noodles and the limp, neon mandarin orange pieces. But I didn’t have any cabbage. Or crispy noodles. Or a can of those nasty mandarins. I did have some Chinese spinach. And some shirataki noodles. And some real mandarins. I looked at those ingredients and said, “let’s make a deal”. Luckily, they came along for the ride. Serve this “salad” at room temperature and you’ll taste all of the components of a typical Chinese Chicken Salad, but it’s packed with more fresh vegetables and nothing from a can. Because you know that greasy spoon down the street bought cases of those mandarins when he opened, um, 30 years ago, and he’s still working his way through them. Let’s start with the noodles. I used shirtaki (the tofu wonder noodle!) because that’s what I had on hand and, let’s be frank, I was too lazy to boil some dried pasta. I mean, someone should slap me! Too lazy to boil pasta? We’ll leave that for another post. Then we need some chicken. I had roast chicken leftovers so I picked off some of the meat and cut it into bite-sized pieces. A nice fresh chicken breast sauteed in a pan would do just fine. Cut into bite-sized pieces. Next, the veggies. I had some really awesome Chinese-Cabbage-I’m-guessing-sort-of-greens in the fridge. To be honest, I don’t actually know the name of them. They look like a longer version of spinach and have really pretty little yellow buds. No idea what they are and I was too lazy to ask the lady at the Farmer’s Market. Lazy, again. Apparently this is a theme today! I also added mushrooms because that seemed like a good idea. Really no other reason. Ha! Now, what Chinese Chicken Salad is complete without a vinaigrette?! 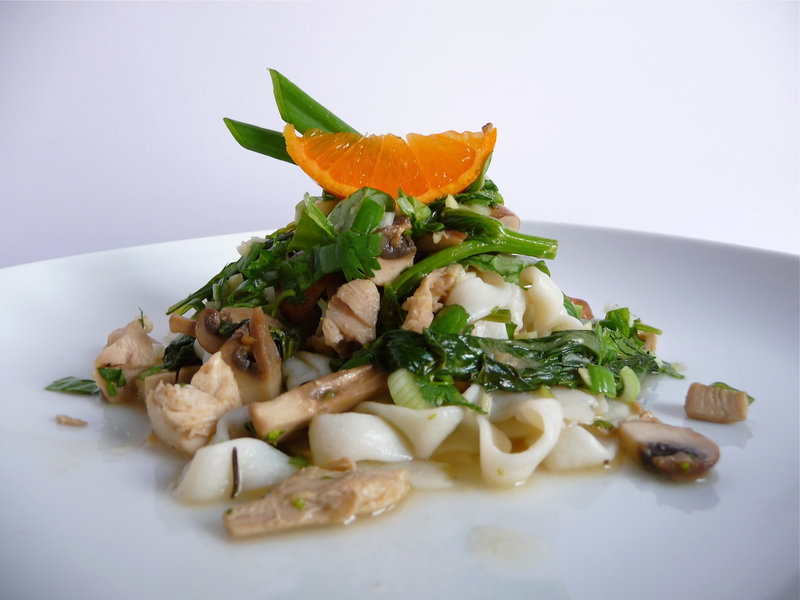 Recipe follows, complete with vinaigrette recipe that includes fresh mandarin juice. Quite a step up from the diner, wouldn’t you say? Prepare your noodles per the instructions. While noodles are boiling, start sauteing vegetables. If using fresh chicken, cut into bite-sized pieces and saute in vegetable oil and sesame oil. Once chicken is about 50% done (still quite pink inside) add in chopped greens and mushrooms, stirring occasionally. If using pre-cooked chicken, start with sauteeing the mushrooms and greens, then add chicken at the end. To make vinaigrette, combine all ingredients in a small bowl and whisk with a fork. Adjust salt and pepper to your preferred taste. When noodles are done cooking, drain but don’t rinse. Add noodles to sauteed vegetables and chicken and remove from heat. Dress everything with your fresh vinaigrette, making sure to coat the noodles fully.Removing the pan from the heat allows the vinaigrette to warm up a little without “cooking” the fresh herbs, retaining their bright color. Serve with a few more slices of green onion on top and maybe a slice of mandarin. No need to reheat, serve at room temperature. This is an excellent, sturdy potluck dish when made with regular pasta (instead of shirataki noodles). Also gets better after a day in the fridge. Enjoy!